"The first thing you need to know about me is that I am Greg Heffley's best friend," Rowley Jefferson writes in his journal. "I know it says that on the cover but I wanted to mention it in case you missed that part." But Rowley remains loyal to his best friend — his superpower is kindness, Kinney says, "and that is a great superpower for today's day and age." 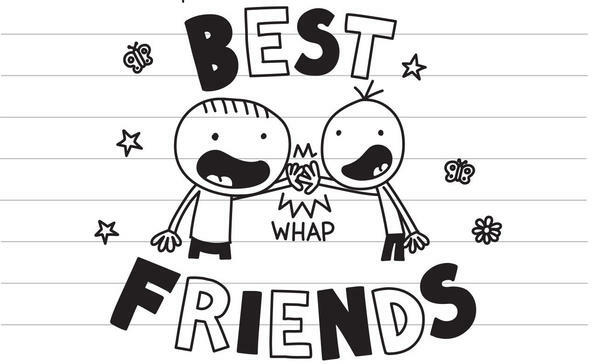 Greg doesn't necessarily deserve a friend like Rowley, Kinney says, "but he got one, so he's very lucky." Kinney also counts himself as being quite lucky, having landed his dream job. "I always felt like I was burning to be a cartoonist — that's what I felt like I was born to do," he says. "I pursued it for a long time, and I finally cracked it." [Greg is a] kid who's in a rush to grow up. ... He's a kid who wants to get to that next level. He wants his bedtime to be a later. He wants a cell phone. He wants to be able to see that PG-13 movie instead of PG and he doesn't realize what a good thing childhood is — what a good gig it is. Rowley is really quite the opposite. He loves being a kid. He's not in a rush to grow up and ... he's very pure. The thing that I've learned from the four [Diary of a Wimpy Kid] movies and from the musical that we put together is that the audience is always rooting for Rowley to win. And you know — as a person who Greg is based upon — I'm always like, why are they rooting for this guy? So I decided to embrace that. He's a really positive kid. He's really incorruptible in a way. It's sort of easy for me to write for Greg, and I wasn't so sure that I could write for this other character who was more naïve, and innocent, and positive. But I found it to be really refreshing. I'm really not trying to moralize to kids at all. I think Greg is sort of like a stand-up comedian who gets up on stage and talks about his own experiences but it's through the prism of weakness and human failing. He wouldn't be that interesting of a character if he was always heroic. ... Greg is always frowning on the covers of the books. I think he's more interesting because bad things happen to him. ... I know lots and lots of Gregs. I think we've all got a little bit of Greg in us. I wanted to be a newspaper cartoonist. That was my goal: To be on the pages with ... ["Peanuts" creator] Charles Schulz and ["Calvin and Hobbes" creator] Bill Watterson and ["The Far Side" creator] Gary Larson. That was my goal and I tried at it for a few years — for about three years tried hard, got nothing but rejections. And then I had the idea to get my comics into books which was really kind of different. Back then, there weren't a lot of books with comic strip DNA in them. So I wanted to invent something new. I worked on it for a long time. I worked on it for eight years before I showed it to anyone. I have a bookstore called An Unlikely Story in Plainville, Massachusetts — and it's great. ... It's so fun to invite lots of different authors to the bookstore. We must have two or three nationally famous authors in our bookstore each week and I love to sit in the audience and learn from them. I'm very, very, very lucky to be in this privileged position that when I write a book, it reaches millions of kids. That's something I really embrace. I try to do my best by kids, and to try to write the funniest books possible. Mayowa Aina and Barrie Hardymon produced and edited this interview for broadcast. Beth Novey adapted it for the Web. We're privileged to speak with a great many famous writers on this program but none whose name is more familiar around the world. If there are any children who are listening and yawning this morning, perk up. You'll want to hear this. Jeff Kinney's "Diary Of A Wimpy Kid" books have sold 180 million copies around the world, international bestsellers that have been made into four movies, for which he's been executive producer. There are 13 installments of Greg Heffley's diary - I'm sorry - journal. But now there's a new middle school Samuel Pepys on the scene, Greg's best friend, Rowley Jefferson. He's the kid at the center of Jeff Kinney's new expansion. It's called "Diary Of" - and Rowley most certainly is - "An Awesome Friendly Kid." Jeff Kinney joins us from New York. Thanks so much for being with us. JEFF KINNEY: Oh, thanks for having me on. SIMON: Rowley is a great, young man. And Greg is not always nice to him, is he? KINNEY: (Laughter) I think he's not. You know, the thing that I've learned from the four movies and the musical that we put together is that the audience is always rooting for Rowley to win. And, you know, as a person who Greg is based upon, I'm always like, why are they rooting for this guy? So I decided to embrace that. He's a really positive kid. He's really incorruptible in a way. SIMON: I don't think I knew that. So Greg is based on you? KINNEY: Yeah. He's sort of based on the worst parts of myself. You know, he's sort of a comically exaggerated version of my worst points as a person. Yeah. He's a three-dimensional character. So he's got his good sides, too. SIMON: Have you grown up since then, or did you have to remain a jerk just aesthetic reasons? KINNEY: (Laughter). Yeah. I hope that that quote gets put on my book somewhere. KINNEY: You know, I think that Greg is sort of complex. And he's a reflection of sort of human foibles. So I think that's what I am, as well. SIMON: Was it a - therefore, a relief to spend some time in Rowley's world? KINNEY: It was. And it was kind of a surprise. It's sort of easy for me to write for Greg. And I wasn't so sure that I could write for this other character who was more naive and innocent and positive. But I found it to be really refreshing. It's been kind of exciting in a way. SIMON: I mean, to help us understand Rowley, he wants to create a character with superpowers that he calls Amazing Guy. SIMON: And which is to give him this backstory - I'm going to quote, "Just had good parents who raised him to be a nice person, and that's why he decided when he grew up he'd fight for people who needed his help." KINNEY: That's right. And he uses padded gloves, so he doesn't hurt the bad guys too much. SIMON: Aw. He's a wonderful, young man. SIMON: He really is. So what's Greg's problem? Or he's just a kid. KINNEY: I think he's a kid who's in a rush to grow up. I think he's a kid who wants to get to that next level. He wants his bedtime to be a later. He wants a cellphone. He wants to be able to see the PG-13 movie instead of PG. And he doesn't realize what a good thing childhood is, what a good gig it is. And Rowley is really quite the opposite. He loves being a kid. He's not in a rush to grow up. And, like I said, he's very pure. SIMON: I have read that, at first, you thought "Diary Of A Wimpy Kid" was a comic strip for adults. KINNEY: Yeah. I was writing for the humor section, not the kids section of the bookstore. My father introduced me to comics. And he introduced me to Carl Barks, Donald Duck and Uncle Scrooge comics. And I always thought of comics as being for grown-ups or maybe just for everyone. So after eight years of working on "Diary Of A Wimpy Kid," I showed it to an editor who brought it in-house. And my eventual publisher told me that I had actually written a children's series, which was an absolute surprise to me. SIMON: Well, you can't complain about results, though, can you? KINNEY: No, I can't. I love this. SIMON: Does Greg make bad choices so that kids don't have to? KINNEY: You know, I'm really not trying to moralize to kids at all. I think Greg is sort of like a standup comedian who gets up on stage and talks about his own experiences. But it's through the prism of weakness and human failing. He wouldn't be that interesting of a character if he was always heroic. KINNEY: (Laughter) Never - sometimes every so often. SIMON: Do I have this right? You just quit your day job? KINNEY: Yeah. I had my day job until April of last year. So I guess it's been about a year. SIMON: I guess the first run for this book is 3 million copies. Do you worry about the future? KINNEY: Do I worry about the future? That's a great question. I wasn't worried until right now (laughter). Am I worried about failure? I'm excited. I am very, very, very lucky to be in this privileged position that, when I write a book, it reaches millions of kids. And that's something I really embrace. I try to do my best by kids and to try to write the funniest books possible. SIMON: I found myself thinking at the end of the book, every young man or woman deserves a Rowley. KINNEY: I think you're right. I think Greg doesn't deserve a Rowley, but he got one. So he's very lucky. SIMON: Jeff Kinney, his new book "Diary Of An Awesome Friendly Kid." Thank you so much for being with us. (SOUNDBITE OF DAVID BENOIT'S "DIARY OF A WIMPY KID") Transcript provided by NPR, Copyright NPR.